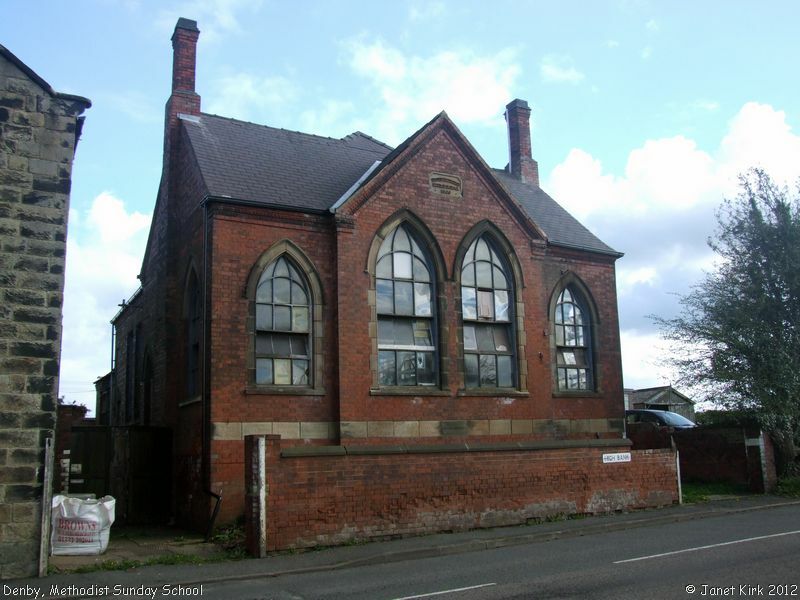 According to Non-Conformist Chapels and Meeting Houses, Derbyshire (1986), this chapel was built in 1841 by Joseph Bourne, a local potter. There is a tablet in the gable inscribed "Wesleyan Chapel Anno 1841", but in 1850 its congregation were to join the Wesleyan Reform movement. Our photograph shows the United Methodist Sunday School, which stands to the right of the Chapel. The plaque on the wall of the building reads "United Methodist Sunday School 1909". Hill Bank is on the Codnor side of Denby, some distance from the centre of the village. Now or formerly Wesleyan Methodist/Wesleyan Reform. Wesleyan Methodist Chapel, Denby shown on a Google Map. Information last updated on 4 Jul 2012 at 17:30. This Report was created 24 Mar 2019 - 12:14:03 GMT from information held in the Derbyshire section of the Places of Worship Database. This was last updated on 6 Feb 2019 at 15:49.